It’s really amazing how Straight Talk continues to expand. Last year they began offering smartphone service via Sprint’s CDMA network. They’ve unveiled a number of Android handsets to go along with that offering, including the LG Optimus Q, the Samsung Galaxy Precedent, and the LG Optimus Black. Now, not even a week after Verizon prepaid began offering an $80 smartphone plan, Straight Talk has picked up a Verizon phone, the Samsung Galaxy Proclaim, for its network. It certainly creates a new level of competition. 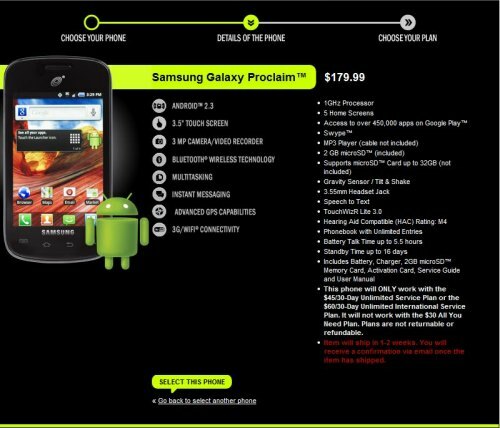 As you can see on the specs page above, the Galaxy Proclaim is no joke. It features a 1GHz processor with a 3.5-inch touchscreen. It might not be the the highest-end Android on the market, but it’s certainly one of the best on a prepaid carrier. And it’s priced right at $179.99 — just $10 more than Verizon’s prepaid Android offering. PhoneNews.com’s Humberto Saabedra provides additional details. “StraightTalk reps have been quoted as saying that the Proclaim will feature a 4GB monthly data allotment compared to Verizon’s own 1GB plan.” The 4GB number seem to also be high compared to Straight Talk’s allotment with Sprint phones, which seems to be around 2GB per month and 100MB per day. Keep in mind, however, that none of the above numbers is official; every one is based on rumor. Straight Talk says the phones will ship in a week or to. They are, unsurprisingly, available only with the $45 unlimited monthly plan or the $60 unlimited international plan. You can preorder yours at Straight Talk’s website. Looks nice. If only it were 4g. If it is Verizon powered does that mean it will work off Verizon’s network? At&t or Verizon are the only providers that work where I live. alf67, yes it works on the Verizon network. Just got mine yesterday and so far so good. My first smart phone and I have a lot to learn. Ordered mine today! With spending time in two different states, I needed AT&T or Verizon for service..so this is great! This will be my first Smart/Android so am really excited! Does it really have GPS? Does anyone know when the Straight Talk Samsung Proclaim will be for sale at Walmart? It is advertised in their ad dated May 27th thru June 2nd, but when I click on it to buy it, it says unknown product. I can’t find it on the Walmart Website or any Walmart within 100 miles of where I live in Nashville, TN. I have a Straight Talk LG Optimus Net, but I constantly drop calls and I have 1 and sometimes no service bars. I found out this phone runs on Sprint. I hope I’ll get better service with the Proclaim and the Verizon Network. I too am waiting for the phone’s arrival at WalMart. They advertised for it, but I can’t find it anywhere. What gives? My cousin bought this phone at Walmart the other day. It works great. Can’t wait til my husband and I can get a couple of them. You certainly can’t beat the price of Straight Talk..maybe their customer service will improve a bit too soon. This is a great phone. I have had it for 3 months now, and have traveled with it, and have never lost coverage. The phone has never failed me, and one night, on the road, I even watched a Netflix movie on it without any glitches(with wifi). 3G is fast enough for me, especially for $45 a month. The GPS navigation is great, I can open several browser windows at a time, and use more than one application at a time. Even the camera is pretty good. For the price of the phone and the price of the service, I am absolutely thrilled. My last Verizon bill in 2010, was $410 dollars. I switched to Straight Talk, and was happy with the price and coverage, though wishing for a smart phone that worked with the Verizon network. Now I have it, and life is good. My husband and I bought the Galaxy Proclaim Phones with Straighttalk and we were very excited about them! But then, after I had only had my for a week, it started cutting out on my phone calls. In the middle of conversation, the person on the other end of my conversation said when I would talk, all they could hear was a ticking noise. So I took the phone back to Walmart and exchanged it for another one. Guess what? I’ve had it 4 days and it’s doing the same thing! Everything else on it works great, but this is rediculious!! I paid a lot of money for this phone to be doing this. And it does it every time I talk on the phone!! Very upset!!!! !